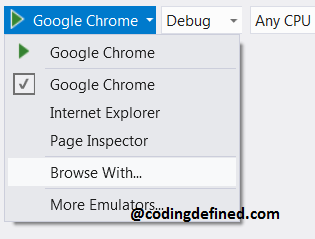 In this post we will be discussing about debugging in Visual Studio using Chrome incognito mode. Visual Studio makes it really easy to debug in your browser of choice. Incognito mode means that Chrome will not save your browsing history. Step 1 : In Visual Studio click on down arrow beside Google Chrome (or whatever chosen by default), and click on Browse With to add Chrome Incognito Mode. Step 2: After clicking on Browse With you will see a window like below, click on Add button to add New Debug Program as shown below. 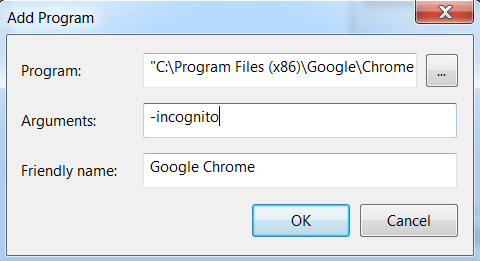 Step 3 : Select program chrome.exe from "C:\Program Files (x86)\Google\Chrome\chrome.exe" and add -incognito in the arguments field. You can give friendly name of your choice (i.e. Google Chrome - Incognito). 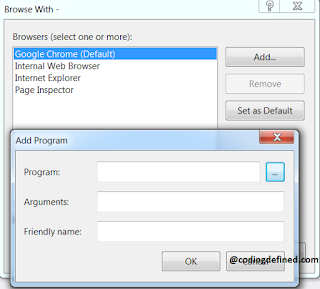 You can set Google Chrome Incognito debug program as default using the button "Set as Default".You can do the same thing for Firefox and Internet Explorer. 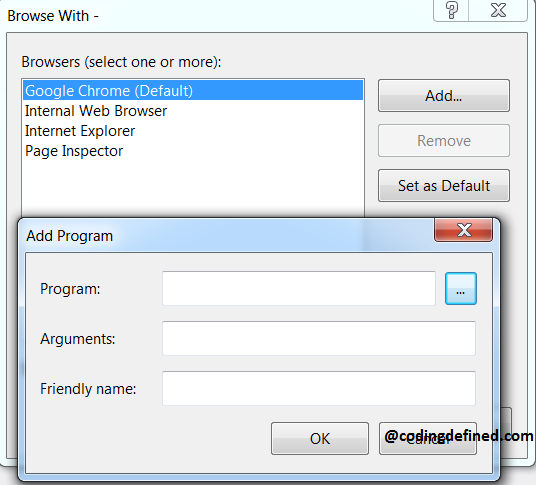 For Internet Explorer you need to add -private instead of -incognito.